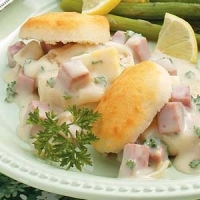 Put leftover ham and hard-cooked eggs to good use by making tasty After-Holiday Ham on Biscuits with a creamy white sauce. In a large bowl, combine the flour, baking powder and salt. Cut in butter until mixture resembles coarse crumbs. Stir in milk just until moistened. Turn onto a lightly floured surface; knead 8-10 times. Pat or roll out to 1/2-in. thickness; cut with a floured 2-1/2-in. biscuit cutter. Place 2 in. apart on a greased baking sheet. Bake at 425° for 10-12 minutes or until golden brown. Meanwhile, in a large skillet, saute ham and onion in butter for 3-4 minutes or until onion is crisp-tender. Stir in the bouillon, Worcestershire sauce and pepper. 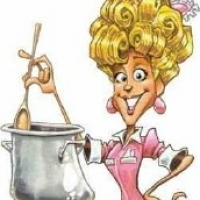 Combine flour and milk until smooth; gradually stir into pan. Bring to a boil; cook and stir for 2 minutes or until thickened. Gently stir in eggs and parsley. Split warm biscuits in half horizontally; top with ham mixture. My Moms used to do something very similar with her left over Ham.